As 2010 comes to an end, I though it would be interesting to investigate the past 50+ years of the severe weather climatological record. 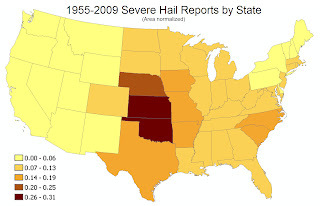 While there are plenty examples of the problems with severe weather reports (e.g., Doswell and Burgess 1988;Grazulis 1993; Brooks and Doswell 2001; Brooks and Doswell 2002; etc. ), they are the only "ground truth" data available to researchers. For part 1 of this series I will be examining hail data; however, I plan to examine tornado, wind, and all reports. It should be noted that all data presented in this series is courtesy of the Storm Prediction Center's (SPC) SVRGIS dataset. 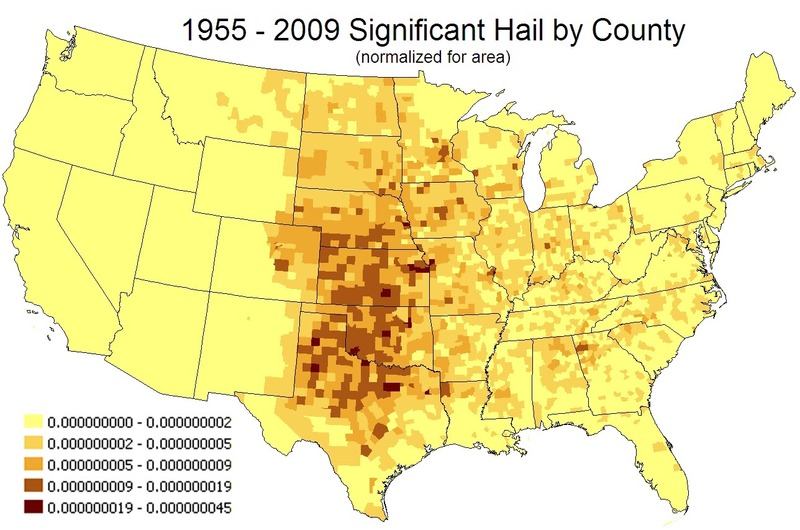 6.6% of hail all reports can be considered significant (+2" in diameter). 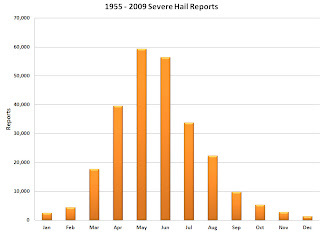 May exhibited the highest frequency of severe reports per year at ~1,080. 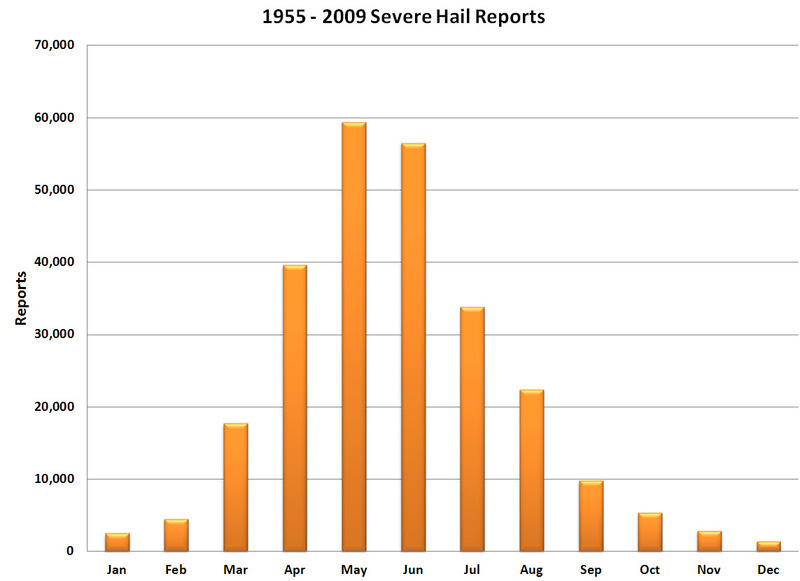 An average year will see 4,654 severe and 308 significant severe hail reports. 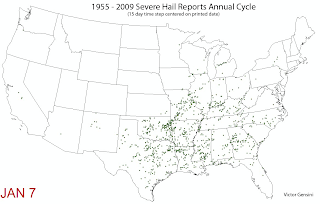 Below, you will find a potpourri of climatological maps/graphs regarding hail data. Enjoy! Brooks, H. E., and C. A. Doswell III, 2001: Normalized damage from major tornadoes in the United States: 1890–1999. Wea. Forecasting, 16, 168–176. Brooks, H. E., and C. A. Doswell III, 2002: Deaths in the 3 May 1999 Oklahoma City tornado from a historical perspective. Wea. Forecasting, 17, 354–361. Doswell, C. A., III, and D. W. Burgess, 1988: On some issues of United States tornado climatology. Mon. Wea. Rev., 116, 495–501. Grazulis, T. P., 1993: Significant Tornadoes: 1680–1991. Environmental Films, 1326 pp.